He opens his Introduction section by defining “problem algae” – a condition associated with explosive algal growth covering much of the tanks exposed surfaces and smothering sessile organisms, the growth of toxic dinoflagellates and/or the release of toxic compounds. These conditions are not necessarily associated with particular species. “Under specific conditions just about any seaweed, turf alga, phytoplankton or cyanobacteria can bloom and become ‘problematic’.” He suggests that problems are solved by a number of targeted corrections rather than by attempting to find one “big fix.” Aquarists who have their algae under control will certainly agree. Chapter 1, “The Biology of Algae,” provides a brief overview of algae taxonomy, evolution, morphology, reproduction and chemical and physical requirements. Some knowledge of this material is critical for attempts to solve algae problems. Chapter 2, “Ways to Control the Growth of Algae,” summarizes in 20 pages the major strategies for combating problematic algal growth. The use of herbivores is presented first, with an interesting section on sea slugs – with excellent photographic illustrations that will permit you to identify those that show up in dealer’s tanks – including the attractive Elysia species and the smaller species of Aplysia. I have found these organisms useful in the early stages of tank set-up as part of a preventive strategy, but difficult to maintain for long. If they can be sustained I think they are an attractive and interesting, as well as useful, addition to the tank community. Other important grazing mollusks – the snails, limpets and chitons are discussed next, followed by helpful crabs, hermit crabs and urchins. The section on herbivores ends with a survey of useful as well as beautiful fish species. The remainder of the book is comprised of a well-illustrated identification guide to the major algae groups and to the diatoms, dinoflagellates and cyanobacteria. For each illustrated genus there is a description, a discussion of desirable and undesirable features and advice on control and, where appropriate, useful herbivores. For those already versed in algae control, with effective systems in place, this section alone may very well be worth the price of the book. I have been interested in maintaining attractive macroalgae since starting to keep marine aquariums – a tendency I suppose from keeping heavily planted fresh water tanks – and it is not easy to find good, color illustrated identification material on the organisms available – especially not with aquarium advice. Working backward, the information on herbivore control also can tip one off to interesting animal species that may be maintained along with cultivated algae – an aid to diversification in the aquarium. That’s something that always appeals to me. John Randall of the University of Hawaii’s department of Zoology is an expert on the family Acanthuridae, the surgeon fishes, and a prolific author of both scientific and popular books and articles, including his important volume, Shore Fishes of Hawaii. He was a pioneer in the use of SCUBA gear in the study of the biology of fishes. This inexpensive new work is an excellent source of information about a group that contains some of the most popular and beautiful aquarium fishes. The volume provides identification photographs of the six genera and eighty species of surgeons and summarizes what is known of their habitat, distribution and biology, presenting them in alphabetical order, by genus and species. Randall uses the subspecies designation to call attention to what he considers geographic variants rather than assigning separate species names to them. As he did in his Shore Fishes, he includes illustrations of juvenile forms and their progression to adulthood when they differ from adult coloration, which greatly enhances the book’s value. While not specifically addressed to aquarists, the book recognizes our interest in this group and includes a short summary of husbandry information, primarily based on the work of Scott Michael and Robert Fenner. The author starts with the family’s nomenclature and general morphology, indicating structures such as spines, soft fin rays and markings that are essential to “diagnosis.” The next section, Biology, discusses the ecology, feeding habits, relationships with predators, social behavior, and reproduction of the group as well as development and growth. He goes on to discuss mimicry, and questions of hybridization and mutant color forms. 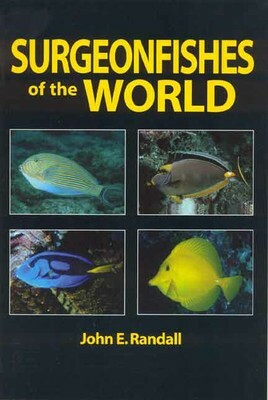 The section concludes with the biogeography of surgeonfishes. This information, while not directed at aquarists, contains much material of practical use. The next section, Identification, which contains the bulk of the book, literally goes from A to Z. It begins with the Achilles Tang, Acanthurusachilles, and concludes with the Yellowtail Tang, Zebrasomaxanthurum, covering all known surgeonfish species. This small, inexpensive, but exhaustive volume is certainly worth its space on the bookshelf of tang lovers. The new page will emphasize material on coral diseases which have been described in the scientific peer-reviewed literature. These diseases have been designated “Characterized Diseases”. The site includes a “Literature” section containing up-to-date peer-reviewed publications and will offer good descriptive photographs of described coral diseases. It highlights the work of NOAA’s new Coral Disease & Health Consortium (CDHC), organized in January, 2002. The CDHC seeks to “…organize and coordinate the scientific resources of the U.S. and its territories to meet the challenge of globally declining coral reefs.” The current disease list is made up of aspergillosis, bacterial bleaching, black band, white band, yellow band, white plague, white pox and dark spot disease. In addition to the photos offered at the site, its sponsors also ” very much enjoin you to offer other good quality photos which may display the diseases in a suitably diagnostic fashion.” I know that among our readership there are those with such photographs. Here is a chance for you to contribute to the important step of clarifying the nomenclature and diagnosis of coral diseases so that we can improve our chances to roll back some of the damage our reefs have suffered. Another important organization, the Reef Check Foundation, has its web site at www.reefcheck.org. Their important document, “5 Years of Reef Check: The Global Coral Reef Crisis, Trends and Solutions,” is now available online. The main findings include indications of severe overfishing; significant decrease in the Indo-Pacific from 1998 to 2000 in the mean abundance of Diadema sea urchins, a reef health indicator organism, possibly indicating ecological destabilization; and critical decreases in population of four species of reef fish – Nassau grouper, Barramundi cod, bumphead parrotfish and humphead wrasse. The survey also found that the 1997-98 bleaching event reduced live coral cover by 10% globally, confirming the notion that coral reefs are a sensitive indicator of global warming. One positive finding is that Marine Protected Areas (MPA’s) in developing countries are showing some success. Five of ten fish and one of ten invertebrate indicators were significantly more abundant inside than outside MPA’s. I would add that the similar strategy of establishing protected Fish Replenishment Areas (FRA’s) to specifically protect Hawaiian reef fish collected for the aquarium trade has also shown positive effects, with small though statistically significant increases in some populations of collected species and the stabilization of the Yellow Tang, Zebrasoma_ flavescens_ in the protected areas compared to the continuous decline in non-protected areas (_West Hawaii Today_, June 19, 20002, p. 5A).